Bluemuda trials are under way at the University of Kentucky (above), the University of Missouri and Virginia Tech. When Brian Winka was managing soccer fields for the city of Chesterfield, Missouri, he thought there had to be a better way to manage Bermuda playing surfaces in the transition zone than the lather, rinse, repeat method of overseeding and transition that never really produced the results he was looking for anyway. Rather than pushing Bermuda aside for rapidly establishing ryegrass and then trying to nurse it back to health, he thought there had to be a way for warm-season and cool-season grasses to coexist. "The big thing was we had a lot of play at our facility. We were parks and rec. There were no away games," said Winka, now a St. Louis-based rep with Advanced Turf Solutions of Fishers, Indiana. "Teams practice here and play all their games here. There's no rest. I was overseeding 30 acres of Bermudagrass every year with ryegrass. The areas where I needed coverage the most, the ryegrass never had a chance to establish, and then the Bermuda suffered because of the ryegrass. I thought it didn't make sense spending all that money and not getting quality results. And by going through overseed and transition I was creating a weaker plant. I wanted to try a different method. I thought if I could get warm- and cool-season grass to coexist and change the fertility to feed the plant slowly and create a stronger plant and increase its traffic tolerance then that made sense." He devised a method of interseeding Kentucky bluegrass into an existing stand of Bermuda that has become known as Bluemuda. 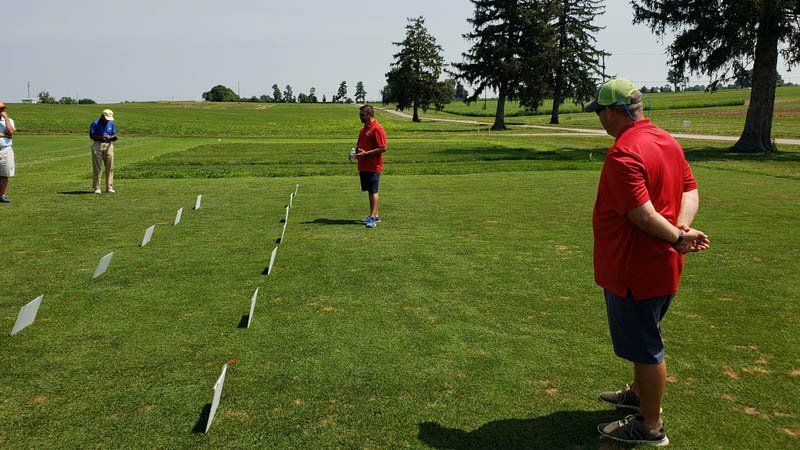 "It is a solution for turf managers in the transition zone," Winka said. "It's an alternative to overseeding with ryegrass and transitioning back to Bermuda in the spring. It's a system of growing bluegrass and Bermuda together year-round." And it's not just for athletic fields. Managed correctly, Bluemuda allows golf courses superintendents to get the best attributes out of cool-season and warm-season turf in fine cut fairway turf. Fine tuning the program, which includes a lean fertilization program, has been tweaked in the field at the University of Missouri, University of Kentucky and Virginia Tech. Each is a perfect location for research into Bluemuda since each experiences extreme hot and humid conditions in the summer and very cold winters. "Missouri is one of the hardest places to grow grass," Winka said. "I know Kentucky is not far off." The system was perfected adopting some of the cultural practices being used by Jerad Minnick when he was a managing multiple fields at the Maryland SoccerPlex. It seems like every year we are trying to push the limits of how far we can go. "We adopted a lot of the things Jerad was doing in Maryland, aggressive cultivation, topdressing, it's all part of the solution," Winka said. "You can't just throw it out there and think you're good to go." The benefit for golf course superintendents is fairway turf that together stands up to stress factors like cold, heat and traffic better than either stand could do alone, Winka said. It also provides an aesthetically pleasing surface. "People have been growing both together for years by accident, but I think I'm the first one to do it intentionally," he said. "Traffic tolerance is better and it has better recovery. Because of the bluegrass, you also get a darker green color and the ability to stripe the fairway very nicely." To date, Winka has helped convert turf managers as far north as central Ohio, as far south as Oklahoma, as far east as Maryland and as far west as California. "It seems like every year we are trying to push the limits of how far we can go," he said. "I think we can south farther than we can go north. You can only go so far north before winterkill becomes an issue. With heat-tolerant bluegrasses we can go farther south." Winka has developed his program using Barenbrug's HGT Kentucky bluegrass seeded into almost any variety of Bermuda. The program works best with a bluegrass that is heat and wear tolerant, germinates quickly and is disease tolerant. "I'm not saying others won't work," he said. "I looked at the NTEP trials and HGT hits the marks I'm looking for." The process has proven successful with several varieties of Bermuda, from old cultivars like Quickstand to newer varieties like Northbridge, Latitude 36 and Riviera. Throughout the summer, the mixed stand can withstand mowing heights of three-fourths to one-half inch. The typical objections come from those who believe a mixed stand will not work. "It goes against what we learn in school," said Winka. "But genetics and things change, and that is what allows it to work. "If you can't manage it correctly, it's not going to work. It will fail if you don't follow the program or fertilize it improperly. If you have patience and follow the program, it will work."